Don't you just hate, trying to get the first tissue out of a new box ? The perforated lid seems easy enough to get off, using a fingernail, for most of us. It's the part, where your fingers go into the box, that drives most of us loony. The pink tissue box, I'll use to demonstrate how, not to grab that first tissue. Depending on how stubby your fingers are, you might get a dozen, on the first tug. Maybe, folks with long fingernails, only snag a few. But, one or two, was all they needed. 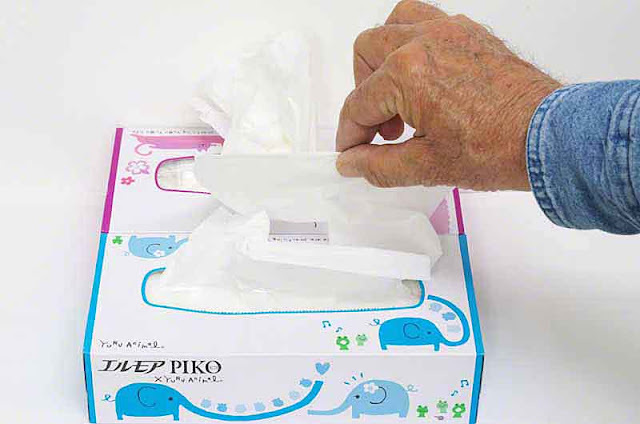 Use one finger, to poke down into the center of the tissue box, as hard as you want to. It will compress all the tissues in the box and, sort of create a vacuum. When, you pull your finger back out, air rushes in and, gets under the first few tissues. Now, when you reach in there, it's possible to yank, only one tissue out of the box. Hopefully, the Yu-Ru-Animal-PIKO people, won't mind my teaching you this trick. 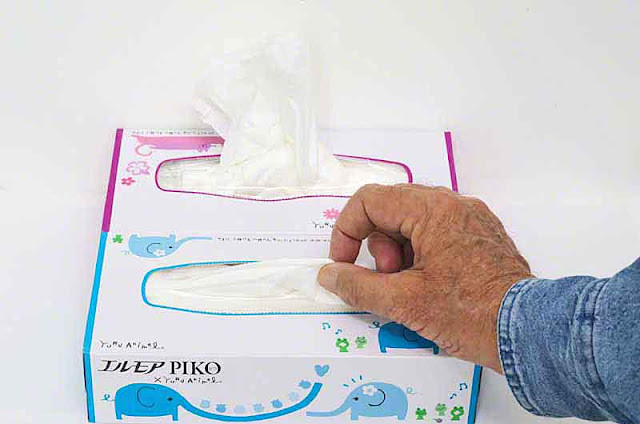 Try it the next time, you open a brand new tissue box and, let me know if, it works for you. Only share this tip with good friends and family. I don't want the tissue people coming after me. And, I'm pretty sure, nobody wants them to start pumping more air into the tissue boxes !